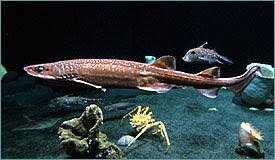 The Filetail Catshark or (Parmaturus xaniurus) is a small deep sea fish that is normally found at depths of over 500 meters. This shark gets its name from the toothlike projections on its skin. This fish can only grow to lengths of about 100cm and is found in the Eastern Pacific Ocean. One thing that makes the Filetail Catshark so unique is that it takes all full two years for catsharks to emerge from their egg cases! The Filetail Catshark is a carnivore that feeds one small fish and squid. It is just one of the over 110 different species of Cat Sharks. Like some other Deep Sea Fish this shark possesses an enlarged gill region which is an adaptation to areas with low dissolved oxygen levels. Due to its tiny appearance and deep depths this type of shark is not considered a danger to humans. You can check out a Filetail Catshark underwater in the video below.